The Anglo-Saxon Chronicle provides a dramatic and near-contemporary narrative of the events of the year 878, one of the great turning points in the history of England. From the Danish surprise attack on Wessex on Twelfth Night to Alfred’s victory at Edington and the subsequent baptism of the Danish king later in the year, we shall explore this narrative and attempt to locate the events in the English landscape. In this context we may be able to understand something of the well-known but curious little story of Alfred and the Cakes. We shall also examine the significance of the Raven Banner, carried by the Danes in battle as a potent emblem of their god Odin. Sam Newton was awarded his Ph.D in 1991 and published his first book, The Origins of Beowulf and the pre-Viking Kingdom of East Anglia, in 1993. Since then he has been lecturing, and writing as an independent scholar in Early Medieval Studies. His latest book, The Reckoning of King Rædwald, was published in 2003. He is also now a Director of Wuffing Education, NADFAS lecturer, and Time Team historian. Backhouse, J. (ed. ), The Golden Age of Anglo-Saxon Art (British Museum, 1984). Harrison, H., The Hammer and the Cross ( Legend 1993). Keynes, S., & M. Lapidge (ed. & tr. ), Alfred the Great: Asser’s Life of King Alfred and other contemporary sources (Penguin Classics 1983). Magnusson, Magnus, Vikings! (1980, BBC Classics 1992). Smyth, A., Scandinavian Kings in the British Isles 850-880 (Oxford 1977). 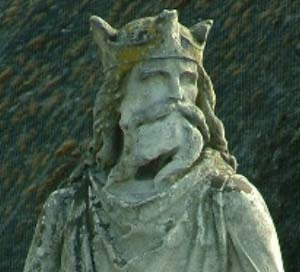 Smyth, A., King Alfred the Great (Oxford 1995).